The Moetan series is an English language study in Japan targeted at Otaku’s and teaches English words using drawn examples from computer games and anime. Ink Nijihara is Moetan’s heroine and Pastel Ink is Ink Nijihara’s transformed persona. 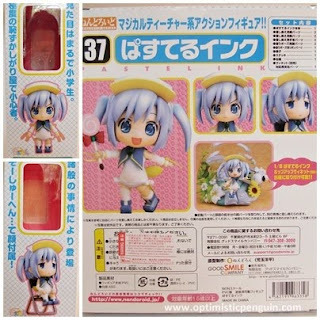 Pastel Ink comes in a standard Nendoroid box. Inside the box the figure is held between two pieces of moulded plastic, with spaces for their accessories. Boxes also come with inserts which act as backdrops in the box and can be taken out and used for backdrops while displaying figures. 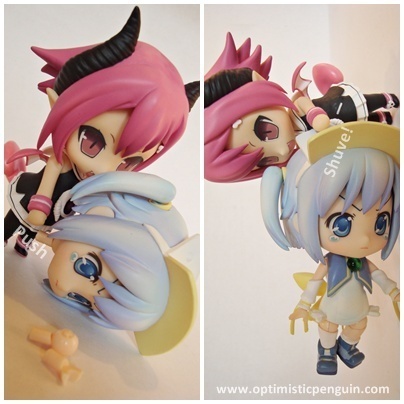 Pastel Ink's backdrop is pink with the word Nendoroid printed all over it. 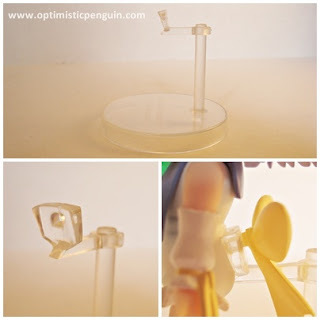 Pastel Ink comes with a stand made of clear plastic, it has a little pole and a piece which slides up and down it, this piece goes in between her bow and her back, securing her to the stand. She also comes with a piece which plugs into the stand of a 1/8 scale figure of herself which Good Smile Company also made. 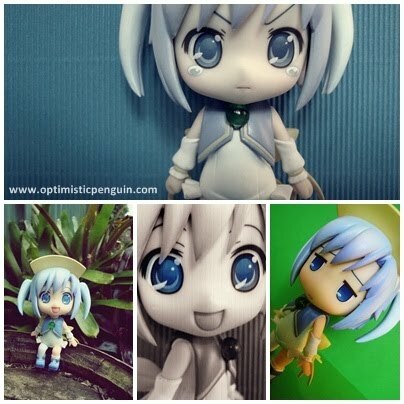 In true Nendoroid fashion Pastel Ink is sculpted as a chibi form of her original character design. Pastel Ink ridiculously cute, from her big yellow bow to her lolly pop. Some nice details to note is her clear green ball on her top, which is very nice, her litter frills on the sides of her leotard and bottom of her hair, which are all sculpted well and look great. Apart from that not much to say, except that she comes with two yellow bows which plug into her back, one for normal standing pose and one with shorter bits for sitting down, which is a very nice touch, and makes posing easier. One complaint is that on her sleeves she has yellow ribbons on her straight arms and not on her bent, which makes a mix of straight and bent arms look a bit odd. Pastel Ink has a lovely colour scheme, of pastel blue and yellow, very simple but cute and baby-doll. Pastel Ink’s paint job is very good. She has a lot of shading which makes her hair and leotard look very nice. Her face's is very nicely done. One thing I love is that she has a little bit of blush on her cheeks. Over all a very good job of painting. Pastel Inks accessories are painted nicely, although the red bow on her lolly pop is a bit messy. Pastel Ink use’s the standard Nendoroid joint system. 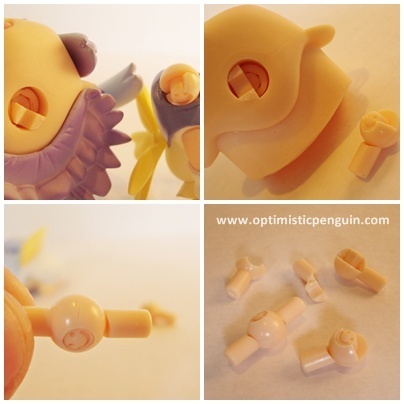 Nendoroid joints are hinge joints with pegs on either end allowing both forward and back movement and rotation. 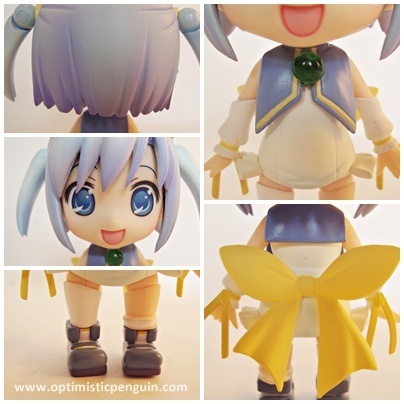 Nendoroid joints also have little smiley faces on them, which is way cute. 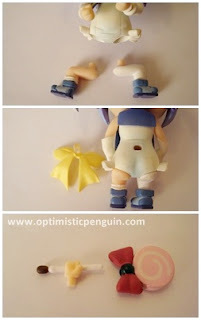 Pastel Ink also has additional articulation with two Nendoroid joints on each of her ponytails allowing them to move around. 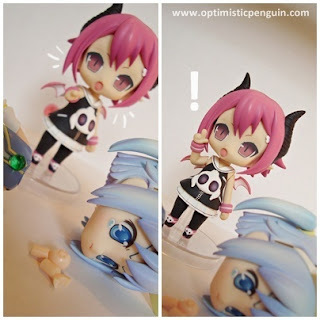 Pastel Ink and Nendoroids in general are not very articulated and so they are limited in ways in which to pose them, but even so they are adorable figures and fun non-the-less. 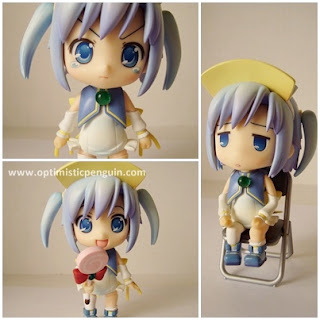 With the use of the accessories supplied, her chair and lolly pop, she can be displayed in a number of poses, sitting on her chair all tired, looking happy with her lolly pop, or on the verge of tears because she dropped her lolly pop. However there are a few areas in which posing is difficult, Nendoroids are rather head heavy and it takes sometime to get Pastel Ink nicely balanced and standing without her stand. Also tragedy struck, my Pastel Ink was carrying a terrible joint flaw. Not one but two of her neck joints were cracked and upon the simple act of changing heads they broke, her reaming neck joint was cracked but I removed it before it could break. 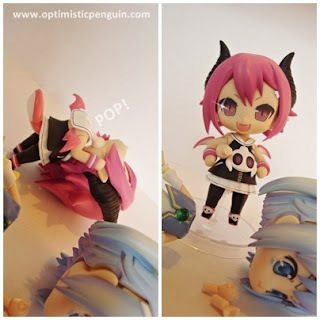 With all neck joints broken and flawed I was upset to say the least, however have no fear I have a Nendoroid with neck joints to spare, and so it's Raspberyl to the rescue. Raspberyl had a plan to fix Pastel Ink's neck joint. Sacrificing one of her own neck joints Raspberyl went to work and helped fix Pastel Ink. She pushed and shoved, until Pastel Ink was all fixed. And Pastel Ink was very happy and thankful, looks like they will be best friends. 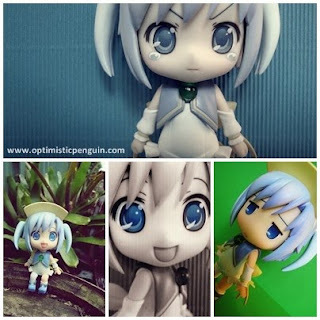 And so my Pastel Ink was saved by a volunteer joint donation, however this now means that I will have to use that one joint for all her faces, I am just lucky I had another Nendoroid, if not it would have been a worse predicament. 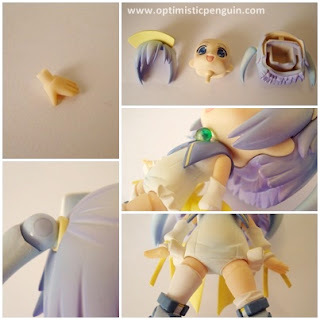 Apparently this flaw and breaking neck joints is common problem with the older Nendoroids, so if buying a Nendoroid for the first time be wary of this. A low score this time because of the broken joints. Pastel Ink comes with three facial expressions; a tired expression, a happy expression, and an on the verge of tears expression. Pastel Ink also comes with an assortment of hands/arms; a pair of open hands, a pair of fists, a pointing hand, and a hand for holding items, a pair of straight arms and a pair of bent arms. Pastel Ink also comes with an extra pair of legs which are in a sitting position, so that she can sit on her seat, there is also an alternative bow for sitting down as well. 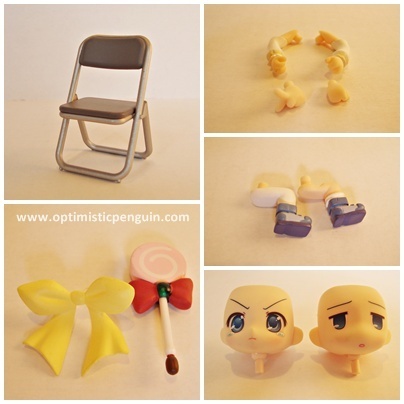 Pastel Ink also comes with a chair for sitting on and a lolly pop, the stick of the lolly pop unplugs so that her hand can slide on. 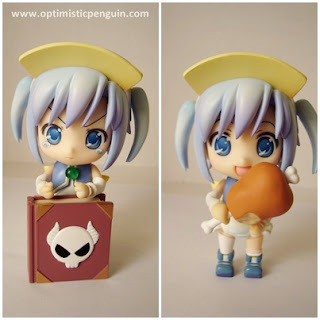 Nendoroids for the most part are compatible with each other, as far as accessories go, as I only have one other Nendoroid and she has a demon book, a piece of meat and a pair of glasses which Pastel Ink can use, and Raspberyl's hands are somewhat compatible with Pastel Ink's. So not a lot of selection here so far, but I have seen other avid Nendoroid collectors mixing and matching a lot of accessories. In general Pastel Ink is one of my favourite figures, despite the problems with her neck joint, she is cute and sweet and has a nice range of emotion and character. 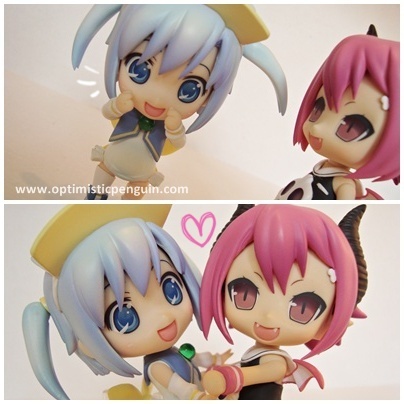 Although Nendoroids as a whole do not have much articulation or accessories the sheer cuteness and character of the figures is win. And so Pastel Ink is a lot of fun to play around with and have displayed in my collection. 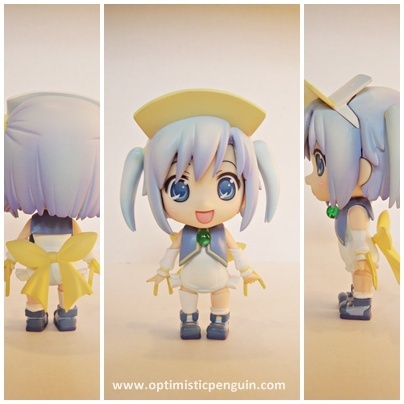 Overall Pastel Ink is one of my favourite figures, she is cute and sweet, and is just so adorable.